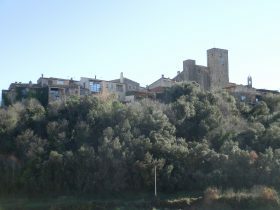 La Bisbal d'Emporda is the principle town of Baix Emporda and former seat of the Bishops of Girona. Situated inland, when you drive through for the first time it's easy to think of the town as just one long stream of ceramics/pottery shops on the way to the coast. In many ways this view comes because the main through-route for the town (linking Girona to Palamos) runs perpendicular to the main interest/historic axis. If you stopped in the centre where the road crosses the river Daro and went along the river either to your left or to your right you would have a completely different view of the town. La Bisbal was an important religious and political centre which is reflected not just in the town, but in the villages around. The walk itself starts in the village of Vulpellac just outside La Bisbal. 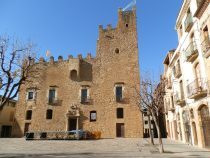 This is a historic medieval village complete with small castle by the church and stone houses that are found in all the villages around La Bisbal. There is plenty of parking just off the roundabout at the entrance to the village. We walk through the village and out the other side, then into the fields along a track. A Tramuntana wind was whipping through the vale on this particular day. The Tramuntana is the northly wind that blows down from the Pyrenees to the coast and so can be quite cold (the southerly wind that blows cool off the sea in the summer is the Garbi). However, it also clears the air and in winter gives fabulous visability. After a while the path turns up towards the woods and we follow a track to the top of the hill. The hill itself is like a finger pointing out from La Bisbal so there are views on either side. At the top you reach the first row of houses of La Bisbal, but instead of going into the town, turn to the right and keep along the top of the finger. After about 200m you should see a sports club below the path and the first views out to the mountains. In this particular case the Tramuntana had also left a little more snow on the peaks so not only was the view extremely clear, the mountains were also shrouded in white. Keep along the ridge until you see a set of gates below you. The path curves down to the gates. 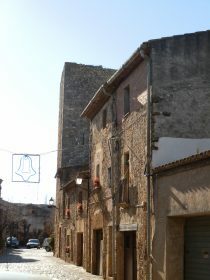 This marks the entrance to Castell d'Emporda. 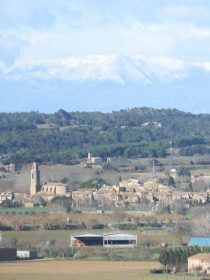 Castell d'Emporda itself sits on the end of the finger giving it a broad sweep of a view over the lands to the north and west. The castle itself has been turned into a luxury hotel, but retains the original building as it's centrepiece. Follow the road below the castle and turn to the left along the street with the no entry sign marked viens (neighbours) - we're walking so it doesn't apply. You find yourself in a narrow street of old houses that would have been the original hamlet for the castle. On old maps Castell d'Emporda is marked as a distinct place - it is not bound up with La Bisbal. Walk down the street and at the bottom turn left and the path takes you down off the finger to the fields below. At the bottom double back slightly to get to a track to cross the fields in order to reach the path that runs along by the river Daro. Although the riverbed is broad, in practice the Daro is an occasional river. Unlike the neighbouring Ter or Fluvia which take their water from the Pyrenees, the Daro rises in the Gavarres so in winter there will often be a steady flow of water, in summer the river can be dry (in Catalan there is a distinction between a Riu - a river that runs all year round, and a Riera which is a river that is dry in summer; there is also a Torrent which is a river that flows only after a downpour). We follow the river along the riverbank. On the other side of the river are ceramics factories and across the view of the town ahead there are the occasional high chimneys, remnants of La Bisbal's most important industry. 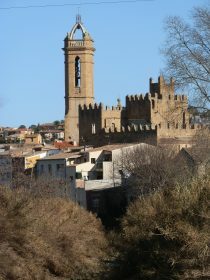 Although the industry has declined relatively speaking, there are still a number of potteries in La Bisbal and the town also has a Terracota museum. Most of the clay is dug in pits on other side of the town, but you would really have to know where to go to be able to see them. The first view of La Bisbal will also give you a view of the main church but also one of the most ill-placed blocks of flats on the Costa Brava - a great bleugh of a building that is both too high (by about eight floors) and terribly placed sitting right in the centre of the town. You can't help but see it and it ruins the skyline and dominates over the more interesting and important historic buildings in La Bisbal. Unfortunately the building craze in the 60s and 70s left a few of these monstrosities across the Costa Brava. Fortunately building standards in the 1980s and onwards have much better protected the townscapes. We follow the path into the centre of town. You can take the path on either side along an avenue of plain trees. It's worth exploring the centre a little. The old centre is to the left as you walk towards it but you might want to keep to the right then cross the Daro at the ancient stone footbridge. Ahead of you is one of the old town gates and going through the gate is a networks of small streets, arches and small squares. On market days (Fridays) the whole centre seems crammed full of stalls selling produce, clothes and almost anything else you can think of. 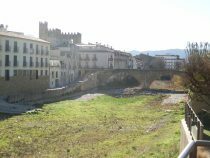 You will also find the old palace-castle of La Bisbal - former residence of the archbishops of Girona (La Bisbal means bishop). After looking around the centre cross the river at the stone bridge once more and continue along the footpath following the river upstream and out of town. Cross the main bypass (it's not too busy) into fields and then cross the river again at the next ford. Even if the river has water there is normally a dry crossing possible. This takes you into an older part near the open-air swimming pool. Continue walking along the river past the swimming pool and out of the town. At the next junction go left. Cross the road and head into the fields. The aim is to circumnavigate the town from the back. 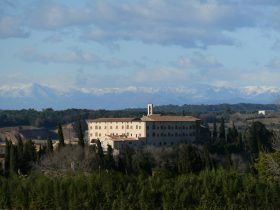 On the hill you'll see the Convent standing proud. As Bisbal is a former religious centre the convent is large and dominates the space around it. 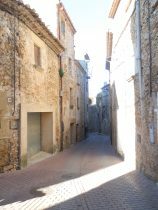 Some of the older streets and more interesting historic places are those that link the convent to the main town centre. Technically, I had the aim of trying to reach St Pol - a small hamlet a little further on, but I neglected to take a map and found I couldn't connect the paths to reach the village. So in this case we follow the footpath around the back of the convent. You'll find signposts and we follow them to Fonteta. Fonteta is another small village that winds up a slight incline towards the entrance to the Fitor road on top of the Gavarres. From Fonteta, it is a flat walk back around to Vulpellac.